“If Congress changes its mind and backs away, it fears it will lose all credibility on this key issue with American workers. With respect to China , I am afraid that means the US Congress has now gone past the point of no return. ” Stephen Roach, chief economist Morgan Stanley. The Looming Trade War with China. China's ongoing massive trade surpluses with America (a record $233 billion last year) have incited demands in the U.S. Congress for the Chinese to revalue their currency by up to 40 per cent , amid claims that undervaluation of the Yuan is giving China's exporters an unfair advantage. Among some of the tough measures being mooted are a 44 per cent duty on polyester fibre imports, an across-the-board 27 per cent tariff on all Chinese goods, and a recently introduced tariff of 11 to 21 per cent on glossy paper . Reasons given as to why “strong action” is called for include China's “unfair currency manipulation” and that “China is illegally subsidizing some of its exports” . So how did we get to this present situation? The China miracle of the past decade has in large part been a result of globalization which has seen a nation of nearly 1.4 billion Chinese move rapidly from a poor, agricultural based economy to become the industrialized low-cost manufacturer to the world. The lowered manufacturing costs of most of the goods consumed in the world today has helped drive down inflationary forces, which in turn have allowed Central Banks to open the spigots further and flood the world with easy credit and liquidity in order to keep markets booming and to avoid any painful recession. The fact that this fiscal loosening also sent the U.S. dollar falling has continued the virtuous cycle as imports into America became even cheaper and more plentiful. With a torrent of U.S. dollars pouring into its coffers, China has recycled these dollars back into U.S.D. securities (as Japan has also been doing) so as to artificially keep the exchange rate in its favour as well as to receive a better return than their own very low interest rates. This in turn has neutralized the “Bond Vigilantes” (preventing them from trying to keep an ever more profligate Federal Reserve honest) by keeping downward pressure on inflation and interest rates. The virtuous cycle has continued. But now it appears the rules of engagement are changing . The Democrat controlled U.S. Congress looks set to halt the loss of millions of jobs overseas by demanding that China dramatically revalue its currency upwards. Meanwhile, America's trading partners are acutely aware that with the housing bubble showing signs of deflating, the U.S. consumer may be just about tapped out and flagging from a spending binge that has squandered much of world savings. They are also becoming increasingly worried about the continued weakening of the US dollar. Consequently China is now rapidly reinvesting a greater share of its trade surplus elsewhere into hedge and private equity funds, and actively acquiring assets and commodities (especially in Africa). 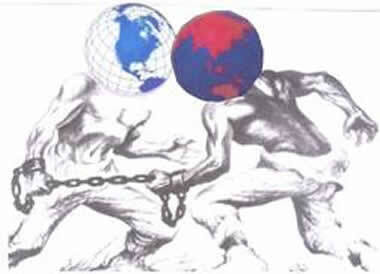 Some accuse it of applying amoral foreign and economic policies in its quest to tie up access to the world's resources. This ranges from using it powers of veto in the United Nations to carry favour with resource rich countries, to providing economic or military aid to struggling countries (some being ruined by ruthless and callous leaders) in return for guaranteed resource supply. At the same time China is rapidly building massive military might that can no doubt also be used to gain access to resources by force if necessary. In his latest book “The Coming China Wars: Where They Will Be Fought and How They Can Be Won” Peter Navarro PhD (Assoc. Professor Economics , University California) believes the Chinese have achieved a “crushing competitive advantage” that allows them to undercut competitors not solely through cheap labour. His research makes him believe the advantage is more due to unfair trading advantages that come from currency manipulation, complex export subsidies and tax breaks, the lack of environmental and safety standards, and counterfeiting and piracy that sidesteps Research & Development and Marketing costs. Navarro thinks it ironic that not only is China on track to soon take over the mantle of World's Worst Polluter, but is in danger of turning much of its nation into a dustbowl and vast regions into a toxic landscape. The Chinese counter these claims by stressing that 60 per cent of their exports come from foreign invested companies, and that sometimes the margins retained by China are laughable. For example, of the US$9.99 price of a Barbie Doll made in China only 35 cents stays in the country. China has also been striving to stimulate domestic demand from its own emerging consumers as the country's new wealth trickles down through the population and to encourage its own brand of capitalism. It seems to have succeeded in unleashing a stock market bubble instead. His answer? ... “The great depression of the US repeated in China, exacerbated by an antique banking system that is unable to properly transmit and provide liquidity”. When I read that piece it reminded me of the Academy Award winning Stanley Kramer 1958 movie “The Defiant Ones” starring Tony Cutis and Sidney Poitier (yes I'm that old). In the movie a white convict (Tony Curtis) and a black convict (Sidney Poitier) escape from a southern chain gang. The men, chained together by 29 inch long shackles, and seething with racial animosity, must overcome their hatred of each other as they battle bloodhounds, pursuing law officers, hostile townsfolk and a lynch mob. They quickly realize that their fates are inter-twined and to survive they must somehow cooperate and work together. If one of them stumbles or collapses, then the other gets dragged down as well. Needless to say, if these two Titans decide to battle it out, the other world economies will undoubtedly be hit hard by the fallout…an economic fallout that will lead to recession/depression, a global environmental fallout, and possibly even (God forbid) a nuclear fallout (China has just added a further 5 nuclear subs to its fleet). “Unless you feel like physically vomiting twice during a risk-arbitrage transaction, you haven't earned your money”. A major global hedge fund manager to a hedge fund broker.